When Quintus Fabius Serenus, the man who could become Caesar, walked into his own birthday party he knew it was a trap set by his father to yet again try to find him a wife. Forty-some women sat there looking demure and empty while their fathers' sold their freedom. Escaping to the garden he discovered Livia Pompilia hiding. As she looked at him he found there was nothing empty about her gaze. The bruises that showed beneath the jewels she wore told him there was nothing demure about this embodiment of Venus hiding in the shadows. 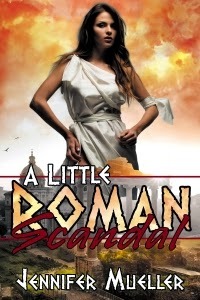 Quintus learned long ago that scandals in Rome could ruin a man, especially one with political ambitions. The only question was exactly who would it ruin, because Livia is no mistress and just marrying her was scandal enough. Read an excerpt from A Little Romance Scandal!